Hungry, the first entry in Richard Nelson’s three-play cycle The Gabriels: Election Year in the Life of One Family, is much like those in his Apple Family Plays. It is a subtle depiction of the way we live now from the point of view of one family in Rhinebeck, New York. However, while the Apple Family Plays took place over four years, this cycle will take place on three dates in 2016 leading up to Election Day, November 8, 2016. Directed by the playwright, the cast of six (with two hold-overs, Maryann Plunkett and Jay O. Sanders, from the previous cycle) could not be more real or believable. 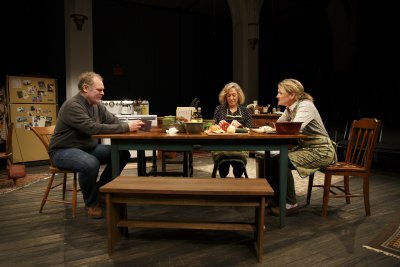 Not a lot happens but a good deal gets said in this elegiac comedy-drama set in the kitchen of the Gabriel home on South Street. But it is not just the election which they speak of only obliquely (wouldn’t it be nice to see a woman president in our lifetime; many women don’t like Hilary Clinton, etc.) Land values are going up sky high as the rich are buying summer homes in the area, and it is impossible to get into the restaurants anymore. George (Sanders), who is a carpenter of fine furniture, has a rich client who is used to negotiating and expects him to knock 20% off a big job. Hannah who works for a caterer is incensed that a client has rented the entire historic mansion Wilderstein for a wedding, but is having the food brought up from New York City. Unlike the Apples, the Gabriels feel marginalized and that they are treading water just to stay in place. While the Gabriels aren’t particularly articulate, they do speak in metaphors. The reading from an 1884 cookbook is really a subtle message that things haven’t changed that much for women over the years, just as the debatable statement that Eleanor Roosevelt’s home Val Kill may just be the only American monument to a woman. The fact that old Mrs. Gabriel (Roberta Maxwell, offstage throughout most of the play) remembered voting for Franklin D. Roosevelt five times is a reminder that we once had great Democratic leaders. Talk of a meal at the White House during the Bill Clinton administration is meant to show how much things have gone off the track in the last 20 years. And like the museum at Hyde Park, things have changed but not for the better. The cast of characters is made up of Mary (Plunkett), Thomas’ third wife; her brother-in-law George (Sanders) and his wife Hannah (Hawley), her sister-in-law Joyce (Amy Warren), a costume designer who lives in Brooklyn and doesn’t visit very often; Karin, Thomas’ first wife who isn’t entire certain that she is welcome (Meg Gibson), and George and Joyce’s elderly mother Patricia (Maxwell), now living in a senior assisted living residence and whose memory may be unreliable. Under the playwright’s direction, this worthy ensemble brings a great many quirks and foibles to their three-dimensional portraits: the hostility to Karin’s presence, Joyce’s avoidance of visiting her mother, Mary’s anger at Thomas dying and leaving her behind, Mrs. Gabriel’s talk in short hand in order to get her children to spend time with her. Nelson gives us a great deal of family reminiscences both because the family is remembering the late Thomas Gabriel and that the author is setting up the two plays to come. 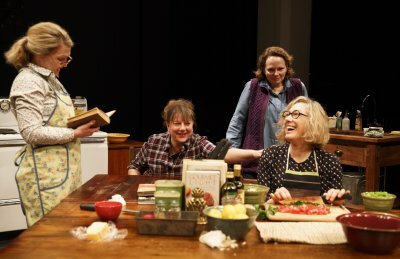 And you may have heard that a complete meal is cooked on stage by the women of the house in the working kitchen designed by Susan Hilferty and Jason Adrizzone-West. The costumes also by Hilferty sum up the way the characters see themselves from George’s workingman’s clothes, to actress Karin’s designer outfit. Like the set, Jennifer Tipton’s lighting is realistic. The sound design by Scott Lehrer and Will Pickens has been kept purposely at a conversational level, but will make it difficult for some theatergoers to hear. Hungry is both an occasional play (written for this moment in time) and a chamber play. Not much happens but a great deal is implied. It will not please all theatergoers. However, it will be interesting to see how Nelson develops the next two plays in the series, What Did You Expect? and Women of a Certain Age, with the same actors. Demonstrating their expertise, the cast is real enough to make you think they are not performing. The lives of NYC subway riders intersect in this corny, likable and minor musical. The novelty is that it’s performed a cappella by a wonderful cast. A corny biographical jukebox musical treatment of The Queen of Disco. LaChanze, Ariana DeBose and Storm Lever are terrific portraying her at various ages. Not a classic, but funny, insightful and appealing new musical comedy.